The Trinity Alps Wilderness has a seemingly endless supply of trails and lakes. Whether you plan to fish, swim, photograph, picnic, camp or just walk in the beauty of the Alps, you will be assured of stunning views, solitude and natural wonder. To have the best experience in the Alps, plan ahead. The Forest Service will have detailed directions and instructions about how to get to the lakes and what to do once you are there. Always carry a map, compass and a free wilderness and campfire permit from the US Forest Service. You may call the Weaverville US Forest Service Office at 530-623-2121. Be prepared to see a variety of wildlife, deer, raccoons, skunks, bear, mountain lions and a multitude of birds and insects. 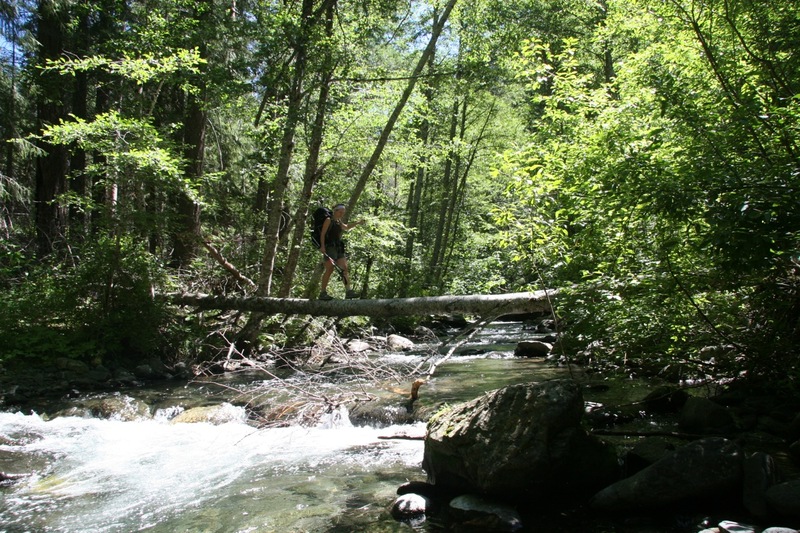 You can find information about the various trails in the Alps in the Trinity County Recreation & Visitors Guide or at Forest Service offices in Weaverville, Big Bar, Coffee Creek, and Willow Creek. Checking the conditions of the trails beforehand is a good idea. You can find this information in the Trinity Alps Wilderness Report. or stop by one of the Forest Service offices. Having the right gear can make or break a trip, especially if something bad happens. An inexperienced backpacker can find themselves in trouble very quickly if not prepared. Located just West of Trinity Lake in the Eastern part of the Trinity Alps Wilderness area, the Four Lakes Loop is an adventurous, rambling trail with breath taking views. Take Hwy 3 to Long Canyon Road, then 2.5 miles to the Long Canyon Trailhead. This multi-day loop trail circles Siligo Peak while visiting Deer Lake, Luella Lake, Diamond Lake, and Summit Lake. When the trail passes by Summit Lake, a detour can be made to climb 8,196 ft Siligo Peak. There are campsites at each lake with the Deer Lake site being the most popular but not necessarily the most scenic. There are other ways to access this trail but the shortest and least strenuous trail to get to the Four Lakes Loop is the Long Canyon Trail. From the Long Canyon Trailhead to Deer Lake, the trail is 6 miles with an elevation change of 3,400 ft. However, with the trail going over both Bee Tree Gap and Deer Lake Pass, the actual elevation gain is closer to 3,800 ft. The first camping along the Long Canyon trail is just West of Bee Tree Gap. This is a little over 5 miles and 3,700 ft elevation gain from the trailhead. Most prefer to head another 0.75 miles to Deer Lake to camp. A great alternative/side-trip is heading to Lake Anna. To access Lake Anna, head South up a rocky gully about 0.75 miles East of Bee Tree Gap on the Long Canyon Trail. The gully is about a half mile scramble with 650 ft of elevation gain. Granite Lake, as the name suggests, rests in a dramatic granite-lined bowl on the eastern edge of the wilderness beneath Gibson Peak. This trip takes you to the 18-acre lake at an elevation of 6,000 feet. For those with a bit more energy, a climb of Seven Up Peak or Gibson Peak offers spectacular views of the highest summits in the Trinity Alps. It’s also possible to extend the trip into a multi-day loop by linking with several trail options that radiate from below Seven Up Gap. The trailhead is accessed from Highway 3 by Trinity Center. Take the Swift Creek Road 7.0 miles to the trail’s start. The first part of the trail follows the aptly named Swift Creek as it dashes its way down a canyon lined with Azalea, Douglas Fir, Sugar Pine, Incense Cedar, and Jeffrey Pine. At 1.3 miles you will reach a trail junction: The trail along Swift Creek continues to Ward and Horseshoe Lakes—worth a trip in themselves—but the path to Granite Lake crosses Swift Creek and climbs up fern-lined Granite Creek, passing several waterfalls and a few flowery meadows, eventually arriving at Granite Lake. From the lake it’s possible to climb by trail to Seven Up Gap, where there are scattered stands of Mountain Hemlock and the rare Foxtail Pine. From the gap, it’s just a short scramble to the top of 8,134-foot Seven Up Peak. If you’re interested in making the trip more than an in-and-out from Granite Lake, consider hiking to the Bear Basin Trail or the Mumford Basin Trail, which courses north from Seven Up Gap. Both trails eventually lead back to Swift Creek and the trailhead. The drive to the trailhead is about 11 miles of packed dirt road. Turn west off Hwy. 3 before Coffee Creek. At the trail junction Little Boulder, a deep water lake with granite walls on one side, is to the left. Big Boulder is about a mile away to the right and is a shallow lake with lily pads, surrounded by forests and granite boulders. Both lakes have a good population of brook and rainbow trout. Camping areas are established and easy to find next to the lakes. Good for a family overnight camping experience. Turn off Hwy 3 about 13 miles north of Coffee Creek. Watch for signs on the 4 mile dirt road drive. The first part of the trail follows an old road with a couple of crossings of Tangle Blue Creek. There are trail junctions to the ruins of the old Grand National Mine, the old Messner cabin and to Marshy Lakes. The last 1/2 mile is a climb to the lake which has granite peaks overlooking a small beach. This is another family friendly hike. Access the trailhead by turning off Hwy 3 just north of Trinity Center. Take the Swift Creek Trail turnoff west. Watch for signs on the 7 mile dirt road drive to the trailhead. Lake Eleanor is a beautiful meadow lake and perfect for a day hike and picnic. Hiking on past Lake Eleanor, the trail will lead you to Shimmy Lake. Shimmy is a pretty lake where you can view Trinity Lake and Ycatapom Peak. It can be warm in the summer. The Forest Service recommends not swimming in Shimmy due to biting water bugs. Brook trout can be found at both lakes. Getting to and enjoying these two lakes can be a fun family outing or a camping adventure for youngsters. Take the Canyon Creek Road in Junction City 12 miles to the trailhead. The trail is 8 miles to the lake with views of waterfalls on Canyon Creek and meadows along the way. This is a very popular trail so you will not experience the level of solitude you find at other lakes in the summer season. Upper Canyon Creek Lake is a 5 minute cross-country hike from Lower Canyon Creek Lake.